Discussion in 'Reviews' started by saxonaxe, Oct 21, 2018. County of East Sussex. England. The section heading is Reviews but my post is more of an opinion really, as apart from testing the ferro rod I have not had the opportunity to test the knife properly. However, it may be of use to a potential buyer of this Opinel knife. A point to keep in mind when considering this knife and it's extra components is that generally being lost or in a survival situation is very different between Europe and the United States. Certainly in the UK, even in the wilds of the Scottish Highlands or the Welsh Mountains, providing people are aware that a person is missing / lost, rescue is generally within hours, rarely longer, even under adverse conditions. On Continental Europe true wilderness Alaska style is not found until well North towards the Baltic Sea or East to Russia, and although there are extensive forests and mountain trails most are a lot more accessible to rescue teams than areas in the USA. 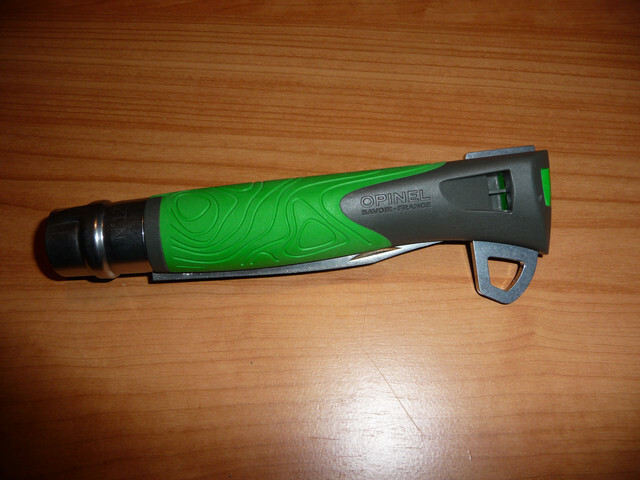 I offer that explanation because the whistle and small ferro rod that come with this knife provide a significant bonus when needed for short term survival until rescue. Of course the same items would be useful elsewhere in the world but might be considered a bit 'gimmicky' by some. Not so in Europe. I appreciate that survival is survival wherever one is, but usually the time taken to effect rescue is the deciding factor in whether one lives or dies. Unlike the Opinels many of us carry as pocket knives the 12 Explore is not a small lightweight knife. It is well made, robust and quite heavy with a non slip handle. 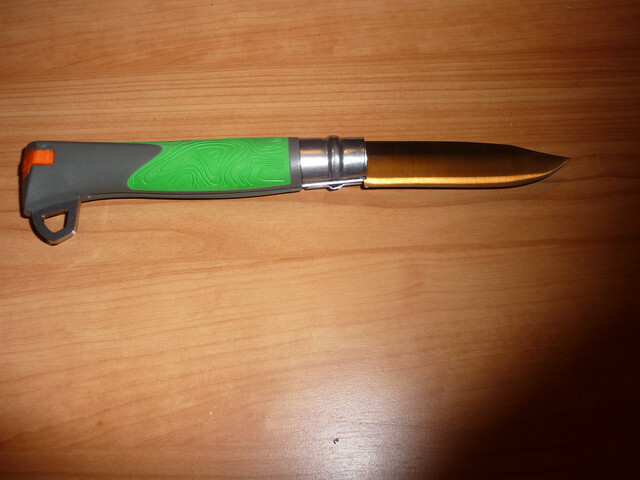 Fully open it is 10 inches long, 4 inch stainless steel blade with the usual Opinel locking ring feature. The handle is 6 inches long and made of a patterned, grippy plastic type of material. 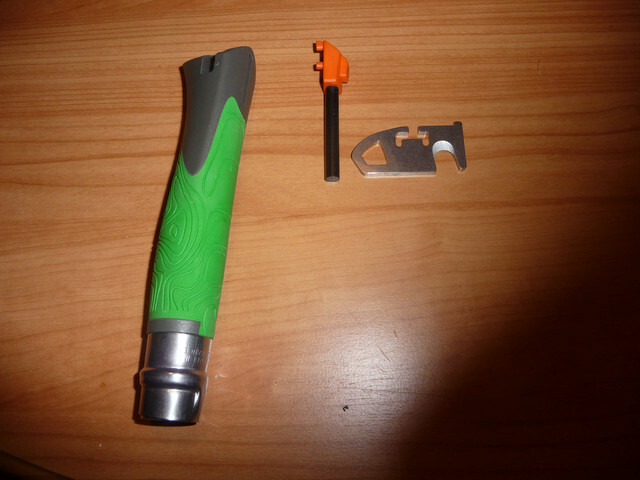 There is a stainless steel locking piece in the handle which has a curved safety cutting blade on one end useful for cutting paracord or similar without opening the main blade. The locking piece also serves as a lanyard attachment point. An effective whistle is incorporated into the end of the knife handle. The small ferro rod locked into the handle has a striking length of almost 2 inches and works well when scraped on the sharp spine of the blade, also the plastic fitting on the rod makes it easy to hold with cold hands. I am not in favour of fixed blade knives with survival items on or in the handle, as I usually go on the premise, 'lose your knife and your survival kit goes with it' but with this knife which in my case will be carried as a spare or back-up in my Bergan, it is a useful addition to my kit. LostViking, PMSteve, Paulyseggs and 11 others like this. It is nice to see traditional knife companies like Opinel producing items such as this. No doubt, if you asked anyone who was ever in a survival scenario without such a tool if this would have helped, undoubtedly they'd say yes! It's a good tool with multiple uses, nothing wrong with that. LostViking and Beach Hiker like this. I have -and very much like- the smaller cousin of this, the "outdoor" (I think that's the name, anyway...). It's an 8 in size... it has a partially serrated blade, and an excellent whistle in the handle. Very nice. Looks like a solid design, and the topo map is a cool aesthetic touch. That. A canteen kit and a pocket sized space blanket. Your good for a light trip . I'm just not sure in the extra value in this over a standard no 12?